Once again, the first Saturday in May, this Saturday, May 2, 2009, is (Hooray!) Free Comic Book Day! Comic book shops across the U.S. will offer a number of free comics, published specially to be given away as examples of the publishers’ lines. Many shops also hold creator signings, sales and other special events. For more details, see my previous posts on Free Comic Book Day 2008, Free Comic Book Day 2007 and Free Comic Book Day 2006; particularly the latter, in which I discuss the event in more detail and suggest why those who don’t ordinarily read comics take the opportunity to check some out and see your local comic shop on its best behavior. I also give a brief introduction to comic book specialty shops for those who don’t usually venture therein. 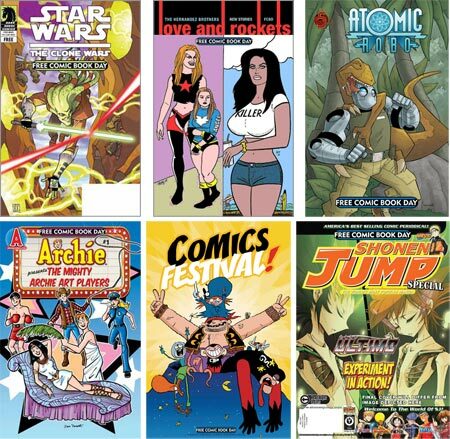 The Free Comic Book Day web site features a convenient Zip Code based comic book shop locator to find a shop near you. Check with the individual shops to see the degree of their participation. Some offer all of the free titles (“Silver” and “Gold” titles), others only the most popular (“Gold” titles). My recommendation this year, if you find a shop that is offering the “Silver” titles, is to look for the Love & Rockets Sampler (above, top center), with art by Gilbert and Jamie Hernandez. We live in a wonderfully weird world, in which life has taken forms more spectacularly bizarre and varied than the imaginings of any fantasy or concept artist (which, given the talents of many of those amazing artists, is saying something). Nature has provided us with a record of some of the wildest experiments of the past, most notable among them might be the dinosaurs, which have captured the public’s imagination since the first artistic reconstructions of them in the 19th century. But there are many eras of geologic time and restless evolutional experimentation in nature’s vast fossil scrapbook, from long before the dinosaurs as well as the epochs between their demise and our short time on the stage. William Stout, a multi-talented artist who I have written about previously, has created murals of several periods of prehistoric life for The Houston Museum of Natural Science, Walt Disney World’s Animal Kingdom, and the San Diego Natural History Museum (see my previous post on William Stoutâ€™s murals for the San Diego Natural History Museum). Flesk Publications, a terrific independent art book publisher that I have also written about before, has published a lavish, beautifully designed and printed book devoted to displaying all of Stout’s prehistoric life murals. The book is 144 pages in nicely large horizontal coffee-table format (10×12″, 25x30cm), crafted with with Flesk’s usual meticulous attention to quality and detail, and features reproductions not only from the finished murals, but from the preliminary half-size paintings submitted to the museum paleontologists for approval before the final paintings ere undertaken, as well as the sketches on which they were based and even some of the briefly notated thumbnail sketches that preceded those. In fact, as much as I admire Stout’s final mural art, which displays a painterly approach rarely found in scientific murals, it is often his beautiful pen, ink and watercolor drawings that I find most appealing. As I mentioned at the outset, there are wonderfully strange animals from many periods of life on Earth represented here, from the time before the dinosaurs up to our own ancestors, arrayed in dramatic scenes teeming with life and alive with color. The book attempts to show not only the range of the mural subjects, but the range of artistic approaches Stout applied to the various tasks involved in the process of creating the murals. There is a pleasing variety to the formal and informal pencil drawings, ink sketches, watercolor renderings and finished oil paintings within the overall continuity of Stout’s recognizable style. The Flesk Publications page devoted to the book unfortunately only shows a couple of images from the book, so you don’t really get a feeling for that variety. You can see some of the paintings for the San Diego Natural History Museum in high-resolution here, and you can see a brief look at one of the ink and watercolor drawings in the animation on the Museum’s Fossil Mysteries page (from which I extracted the low-resolution image above, top), but there is no other web preview I can find to show you the character of the pencil, pen and watercolor renderings. William Stout: Prehistoric Life Murals is available through the usual book channels, but can also be ordered directly from the Flesk Publications site in either a regular hardcover edition ($39.95), or a limited signed edition ($49.95). 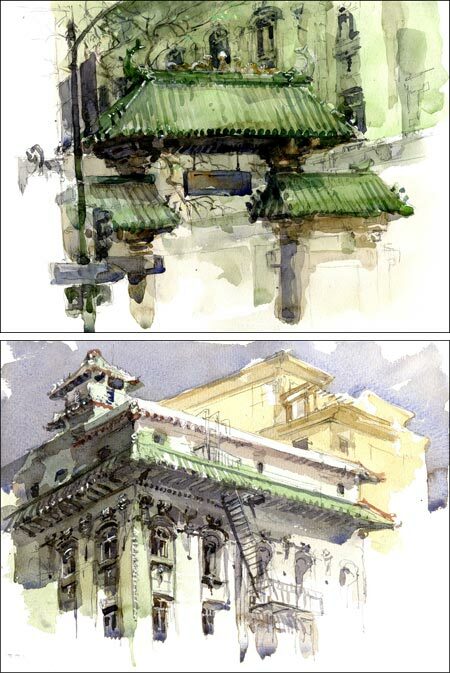 I came across the work of Mark Taro Holmes when I was struck by these two watercolor sketches on the Urban Sketchers blog. They were from his participation in the recent Sketchcrawl in San Francisco (see my posts on a previous Sketchcrawl, and here). 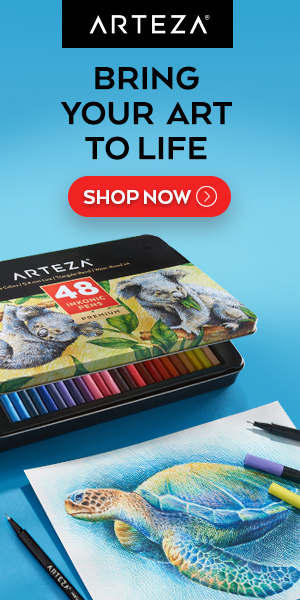 I then looked him up and found his sketch blog, SKETCHtaro, which has a wonderful array of his sketches, largely in watercolor or pen and ink, of both landscapes and figures. His figure drawings have an engaging looseness, within the framework of accomplished draftsmanship. He has an unusual approach, sometimes drawing the figure in line, but multi-colored watercolor line, applied in brushstrokes that vary in weight and translucency as well as color . His black ink drawings are frequently concerned with shadow and the play of light across architectural details. Steven Assael is a New York artist who paints and draws figurative works that feel simultaneously sharply focused and viscerally textured. Assael also looks for texture of another sort, in the vivid personalities of his subjects, often drawn from the enthusiasts in the body art subculture and carrying their own secondary visual texture in the form of tattoos, interesting piercings and a bit of costume. 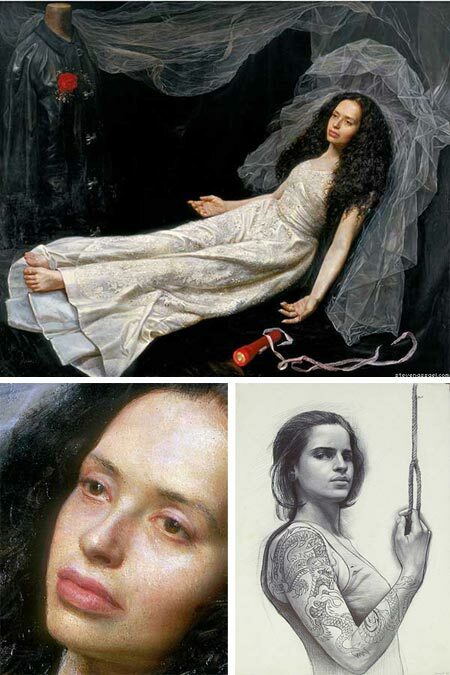 He also takes on more mundane subjects, but sets them off in thought provoking compositions, like his dreamily posed Bride I (above, with detail) in which the bride seems to float, as if buoyed by an invisible, curved body of water. Asael works from life, eschewing photographic reference for the experience of painting from life, and the more direct and acute observation it affords. His subjects can also be straightforward portrait or figure paintings in addition to his more formally arranged compositions, but there is always a feeling of a pause, a contemplative suspension of time, in his portrayals. Of particular interest to me are his drawings, both life studies and portraits, with their subtle line, carefully observed tone and an ability to capture a feeling of the sitter’s character. Asrael studied at Pratt Institute, including independent study in Europe on a Pratt Scholarship, and currently teaches at both Pratt and the School of Visual Art in New York. There is currently a show of his work at the Forum Gallery in New York that runs until May 2, 2009. There is a book of his drawings, a collection of paintings, and an earlier collection of both paintings and drawings; all out of print, I think, but sometimes available through Amazon and other book search services. Note: Some of the images in the sites linked below should be considered NSFW. Working with lead artists David Whittle and Sainty (Henry St. Leger), who are known as street artists, directors Ben Foley and Chris Hopewell created a 30 second television commercial for Acura called Wall Art in which the car is shown in an animated environment. What you might assume at first to be CGI, compositing the car image into cartoon drawings done on paper or in a computer graphics program and composited together in the usual computer special effects suites, is instead a completely different approach, in which the images themselves are drawn, life size, on huge 60′ x 40′ (18m x 12m) canvases. The canvases were drawn, painted over and redrawn, as if they were enormous animation cell backgrounds, and other elements were drawn on the floor and even on the car itself, animating a life-size driver and the images of birds as seen from above against the car. Even the apparent turn of a corner that goes by at one point is hand drawn animation. All of the apparent motion is in the drawn animations and the position of the camera. The car never moves. The Acura Wall Art shoot took 17 painters and 240 hours of shooting over ten days. There is a “making of” video on the t5m.com site, that includes the final 30 second spot at the end. 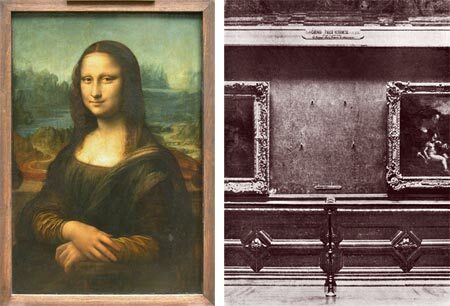 In 1911, Leonardo da Vinci’s portrait of a noblewoman, titled Portrait of Lisa Gherardini, wife of Francesco del Giocondo, sometimes titled La Gioconda, and known popularly as the Mona Lisa, was stolen from its place in the Louvre in Paris. The event caused an enormous stir, eclipsing for a time talk of an impending war, and was the focus of much attention worldwide; until the crime was apparently solved 28 months later with the apprehension of the thief and the return of the famous painting to its former space. When I say “apparently solved”, I don’t mean to imply that the painting returned was not the original, that was established without doubt; but Dorothy and Thomas Hoobler, in their book The Crimes of Paris: A True Story of Murder, Theft, and Detection, suggest that there was more to the theft than was apparent, and that the true crime went unsolved. Stealing Mona Lisa is excerpted on the Vanity Fair site and makes for an interesting read. If it’s true, I only have this to say about the real “victims” of the crime — it couldn’t have happened to a more appropriate bunch of selfish creeps.